I'm fond of collecting house wares and accessories for dining and kitchen. Since I'm having my kitchen repaired and renovation I would like to add few collections to coordinate with the new kitchen I have now. This one I saw at Groupon Phils. would look nice in my cabinets and would also be functional as well. I love to cook and store left overs so if any of my kids wants more they will only look for my food keepers and they will enjoy what I cooked for them even when I'm in the office. This one is offered at 47% to 56% off depending on your choice of package. 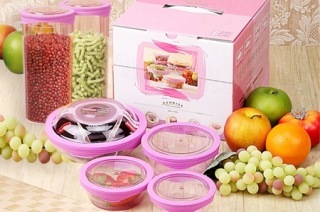 Like for one 6-piece set of Sunrise Food Kepers you'll get it for PhP329 instead of PhP320. Great deal and so much value for your money.